We are receiving quite a pile of feature requests and trying to figure out how to improve the app for users. While the development team is working like cursed on the roadmap and urgent issues, we come up with a dozen of various workarounds. For the sake of fairness in the galaxy, we are starting the Workaround Marathon: publishing the most useful tricks here, in Outline Blog. Let’s start with whiteboard and document recognition. We don’t have our own tool that might drive your papers and whiteboards digital. But that doesn’t mean we wouldn’t help you to drag those digitalized papers and whiteboards into Outline. Enters Workaround! Let’s try Scannable. It’s pretty much awesome when you need to collect the handwritten / printed pages in one place (say, in Outline). Wait isn’t it an app by Evernote?! It is. But it’s a standalone app, which means you don’t have to own original Evernote to run Scannable. 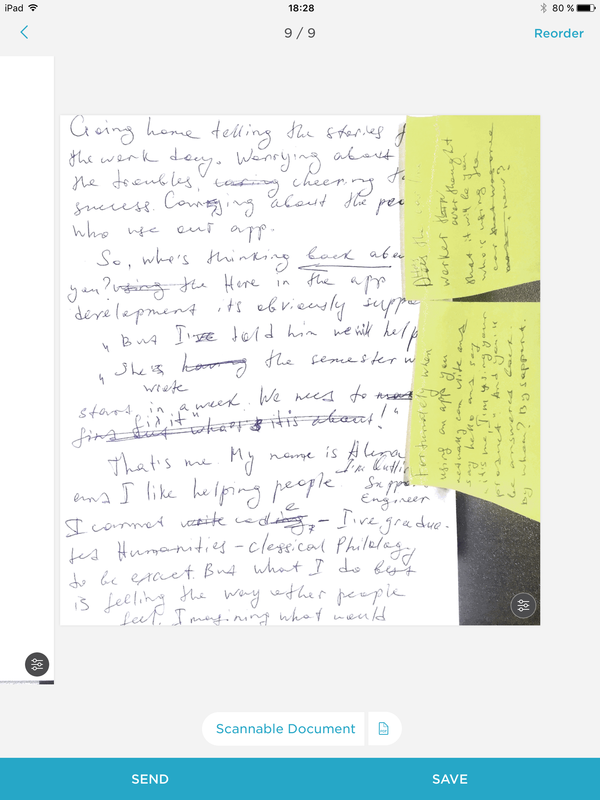 And in case you do have Evernote but not happy with it, you can always import to Outline. 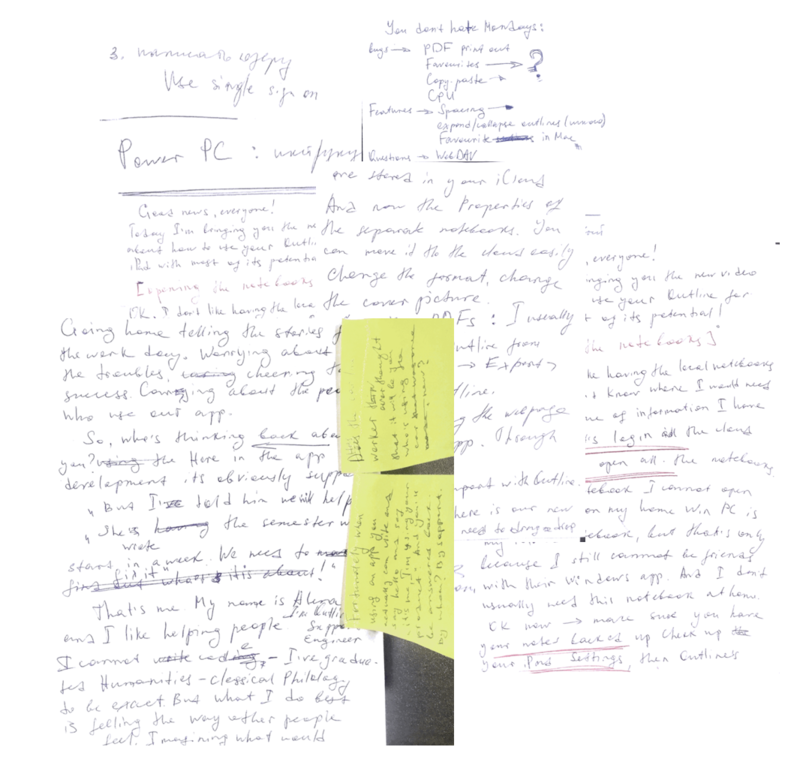 Assume you have zillions of papers with handwritten notes you take during meetings or some rough copies of articles. But at one point you realize there are just too much of paper you don’t want to keep it in hard copies anymore. 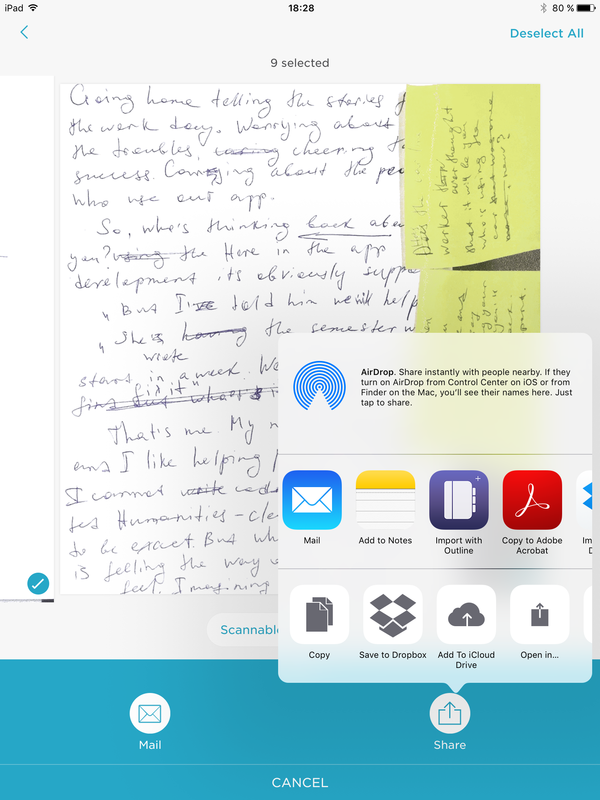 No problem, make the scans, upload to some archive notebook in Outline and return to them when you need. Sounds worth trying? Here are the simple workaround steps. [Step 1] Make a photo in Scannable, tap Send. 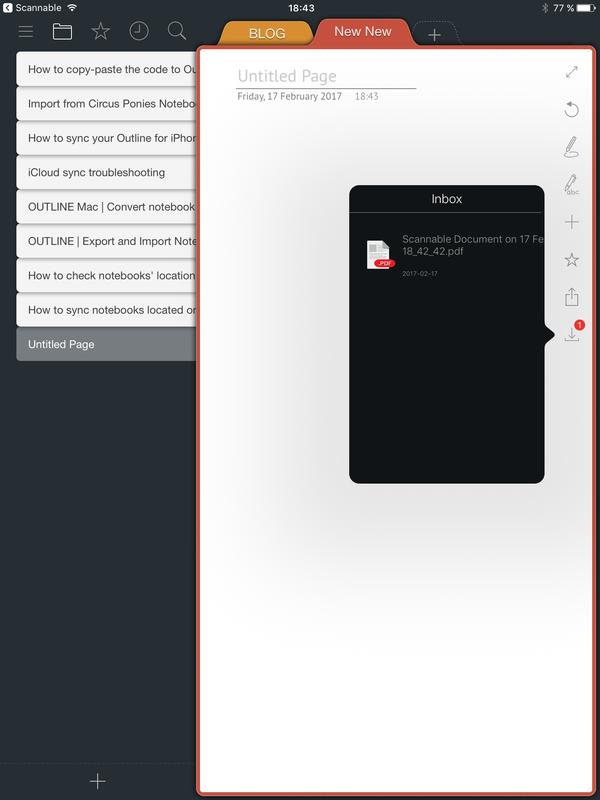 [Step 2] Choose Share > Import with Outline. [Step 3] In Outline just select the page and Drag&Drop the clipping from Inbox. Does the workaround work for you? Share in comments! This entry was posted in Outline for iPad, Outline for iPhone, Workaround Marathon and tagged import from evernote, scannable by Outline Team. Bookmark the permalink. I have been using jot not pro for some time. When I am at a conference I take a photo of the presenter’s slide, using jot not to crop and straighten the image. I then export that to Outline and it appears in the inbox as you have described. Only problem is that I can only transfer one image at a time. Multiple images make my iPad freeze. Happy to hear this workaround is useful to you! Feature request about multiple images – counted!